Complementing yesterday’s portrait of Chris Georgiou, Bespoke Tailor, today I offer this selection of the language of tailors. BABY - The stuffed pad of cloth that the tailor works his cloth on. BALLOON, TO HAVE A – To have no money coming in at the end of the week. BANGER - A piece of wood with a handle used to draw steam out of the material during ironing. BOARD – Tailor’s work bench. BOOT? , CAN YOU SPARE THE - Can you give ma loan? Dating from the time that all tailors used to sit cross-legged at the bench. The tailor would record a loan by chalking it up on the sole of his boot. BUNCE – A perk of the trade. Mungo is one type of tailor’s bunce. CODGER - A tailor who does up old suits. CRIB - Larger scraps of cloth, saved from a length of cloth alloted for a job. The crib can be used to make a skirt or a pair of trousers. Another example of a tailor’s bunce. DEAD - A job is dead when it’s been paid for already. So there is no more money coming in from it and it is as well to get it off your hands quickly. 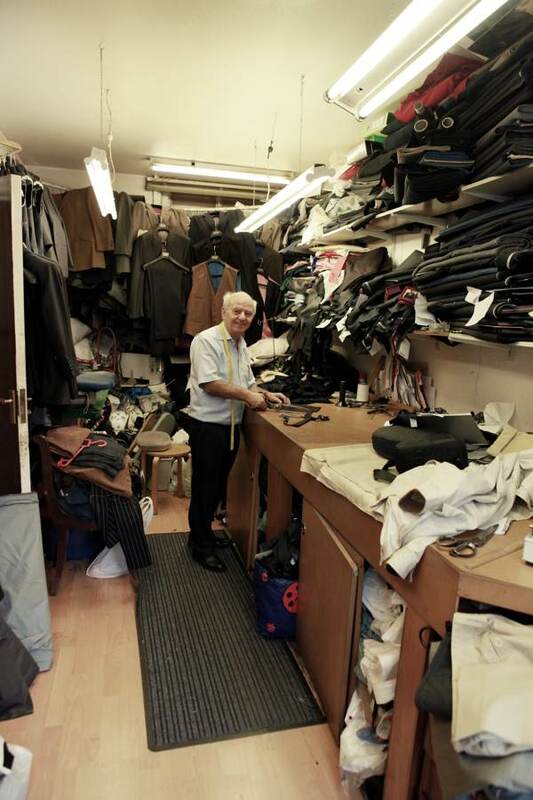 DOCTOR - An alteration tailor – a separate trade in most houses. DOLLY – A roll of material, wetted, and used as a sponge to dampen the cloth. DRAG, IN THE- Late with a job of work. DRUMMERS - Trouser makers. A term of contempt used by jacket makers to describe trouser makers because there is said to be less skill in making a pair of trousers. Trouser makers are also given the more contemptuous name of FOUR SEAMS & A RUB OF SOAP. DUCK SHOVING - An East End expression, meaning making the stitches too big. The West End equivalent is SKIPPING IT. GOOSE IRON - Hand iron, which used to be heated upon a gas flame. INCH STICK - Wooden ruler. KICKING - Looking for another job. If dissatisfied, a tailor might go out looking for another job during the lunch break. A KILL - A job that is no good at all and cannot be resold. eg If burnt with an iron. KIPPER – Female tailor’s assistant, called kippers because they always worked in pairs. This was for their own safety – a kind of chaperone system – so that one could protect the other if the tailor made advances. MANGLE - Sewing machine. Old machine that worked on a treadle looked like mangles. MUNGO – Cloth cuttings. These belong to the tailor and he can make a few pennies by selling them to a rag merchant. ON THE COD – Gone for a drink. ON THE LOG - Piecework. As in most trades, tailors are paid according to the amount of work they turn out. The work is logged up against the tailor’s name in the book. A PORK - A job that customer rejects but which can be sold to someone else. PT, RUBBING IN A – Fitting in a private job eg making yourself a pair of trousers during the lunch break. This practice os allowed in most work rooms provided th tailors are discreet about it, and do it in their own time. SCHMUTTER, BIT OF OLD – Jewish expression for a piece of poor cloth. SKIFFLE – A fast job that a customer wants in a hurry. SMALL SEAMS - A warning expression to a fellow tailor that the person you are talking about is coming into the room. SOFT SEW – A cloth that is easy to work with eg tweed. TWEED MERCHANT – A tailor who does the easy work. A term of contempt for a poor workman, because tweed being soft and rough is easier to work with than other cloths. UMSIES – A name to describe someone who is in the room whom you are talking about but you do not want them to know it. Even if they hear, there is an element of doubt who you are referring to. Our sewing teacher was always very clear cutting scissors were shears not scissors. The word “cabbage” was well known but you don’t mention it. I always thought that it was material left over that the tailor would claim. The better the cutter the larger the piece of cabbage that the tailor would claim. This would then be made into clothes for his family. Am I correct? It’s incredible and quite extraordinary! My late father, who worked in the ‘gown trade’ ( = womens’ wear manufacturing and sales) – an industry deeply rooted in the East End – used to refer to ‘cabbage’ with the same meaning as the term ‘crib’ recorded above. ‘Crib’ sounds like an abbreviation of ‘cribbage’ (a k a a card game), which in turn sounds a lot like ‘cabbage’. The internet tells me that a feature of cribbage is the ‘crib’ — a hand held exclusively by the dealer, which may give a clue to the origin of the phrase….. True, crib refers to four cards held by the dealer in cribbage, two from his own hand and two from his opponents. Mastering which cards to throw into the crib is essential in learning how to win!! All these trade related expressions are fascinating. Thank you as always GA.
How about Spitalfields Yiddish, before it’s all forgotten or assigned to the history books . . . or am I too late?